The NFL could be returning to Los Angeles thanks to a new partnership that will build a stadium and massive entertainment complex in Inglewood. 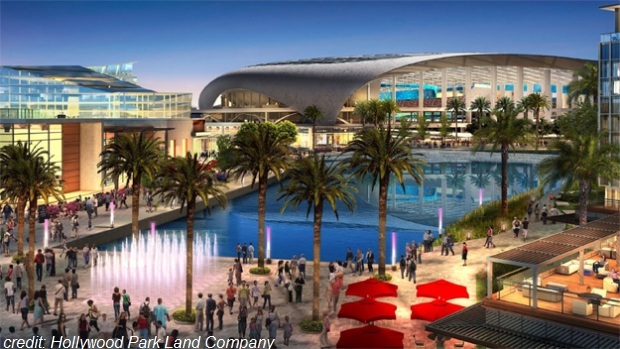 Stan Kroenke, who bought a 60-acre lot between The Forum and Hollywood Park Casino in 2013, has teamed up with the owners of the 238-acre Hollywood Park site to build the new arena. The Hollywood Land Company, a joint venture between Stockbridge Capital Group and The Kroenke Group, plans to build a 80,000-seat stadium, a 6,000-seat performance venue, a 300-room hotel, 2,500 residential units, 1.7 million square feet of retail and office space and 25 acres of public parks, playgrounds and open space on the site. The development, named the “City of Champions Revitalization Project”, will be built at no cost to taxpayers. The stadium project must be approved by voters through a measure, which will be tentatively placed on the Inglewood municipal ballot in 2015. The Rams left Los Angeles for St. Louis in 1995, and the team became eligible to modify or leave its current lease at Edward Jones Dome after the 2014-2015 season. It remains unclear who will play in the arena, if approved.